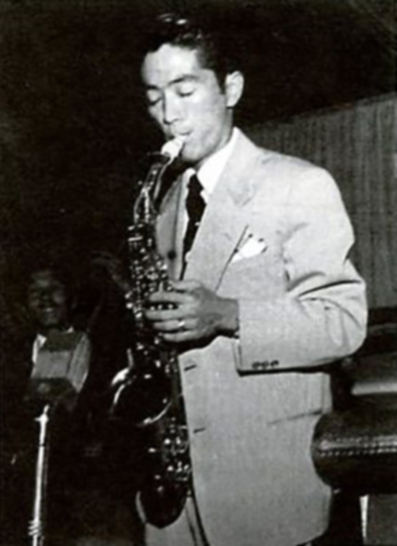 The second-generation Japanese American Jimmy Araki (1925–91) learned to play the saxophone in a World War II internment camp in Gila, Arizona. After the War, Araki was drafted and sent to Japan to serve as an interpreter for the Tōkyō war crimes trials. During his stay there he found time to play music, and he became the pioneering figure in the introduction of bebop to Japan. He later enjoyed a career as a scholar of Japanese literature at the University of Hawaii at Manoa. This according to スウィング・ジャパン ― 日系米軍兵ジミー・アラキと占領の記憶 (Swing Japan: Japanese-American GI Jimmy Araki and memories of the occupation) by Akio Satoko (Tōkyō: Shinchō-sha, 2012). Below, Araki and his group play Broken rhythm (ブロークン・リズム), one of his compositions.